The owners of this local beach cottage decided to shed the home’s 1950s origins in favor of a more open concept layout. The use of traditional styles blended with modern amenities restructured the cottage into a seamlessly flowing, contemporary, family-oriented retreat. 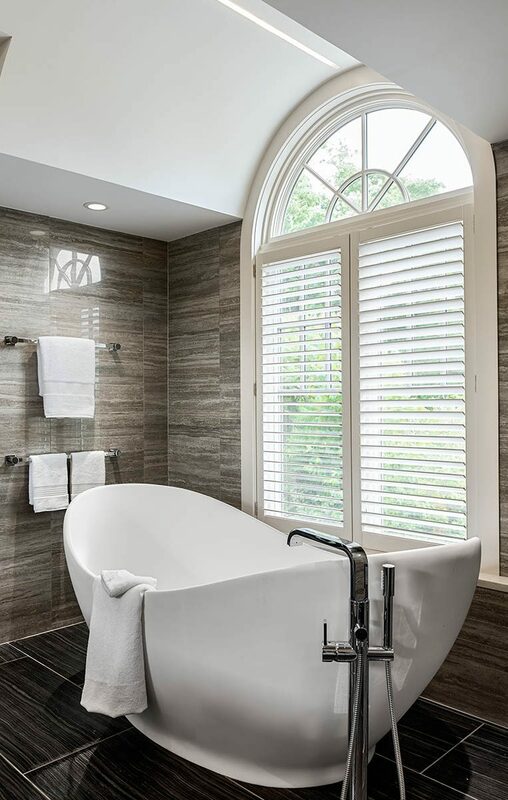 Fueled by the success of the first renovation, our client was ready to update their master bathroom and say goodbye to the last vestiges of the home’s outdated design. They envisioned a modern design with floating vanities, a sculptural tub and floor-to-ceiling tiles. The existing one-way sloped ceiling was replaced with flat ceiling sections with a main barrel vault centered over the existing arched window. The 1980s style block glass was replaced with frameless clear and frosted glass doors, polished chrome replaced shiny brass fixtures and linear textured porcelain replaced green marble floor tiles. 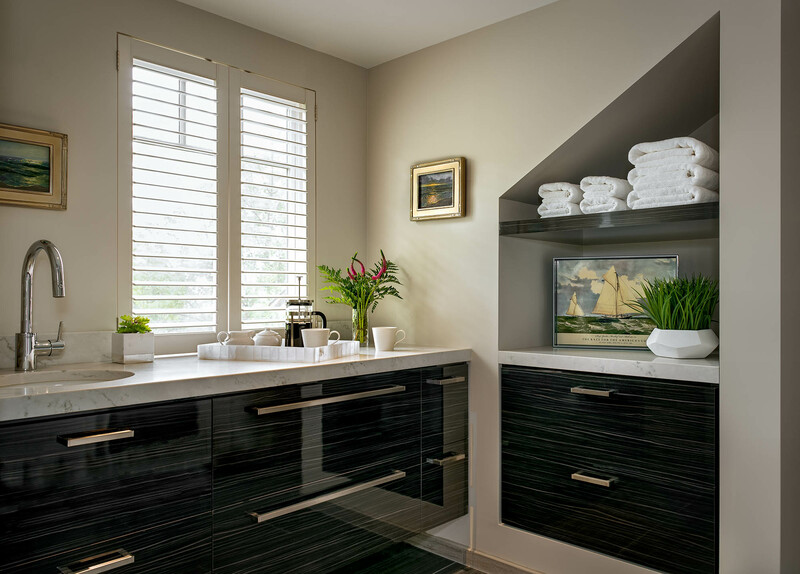 White and grey veined quartz countertops are offset by a dramatic glossy black striated laminate on the floating vanities. Modern LED light fixtures set at 3500K provide daylight like illumination, reflecting beautifully off the polished materials. 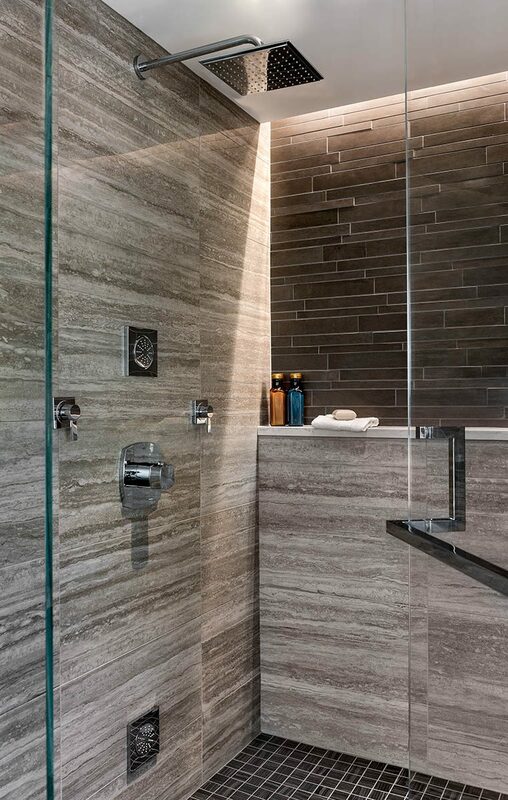 Recessed cove lighting in the shower creates an almost window-like effect due to the color of the light. The oversized, fully tiled shower has a rain head, body sprays and a hand shower to offer several bathing options. 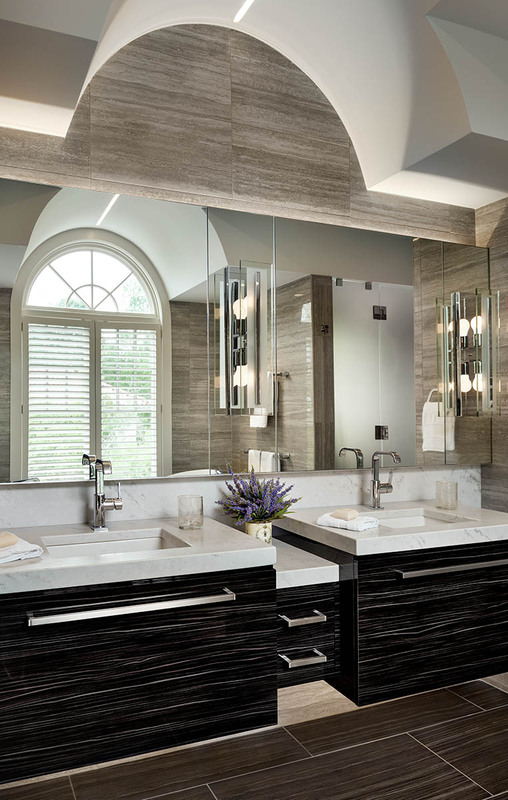 The final result is a striking bathroom filled with the finest modern amenities.